It is so hard to believe that we only have one week left before we break for Easter! This means that we only have 5 days to raise as much money as we can for The Good Shepherd. The children have families have already been incredibly generous, however we still have some exciting events happening. On Friday, we will meet the amazing Woolly! he is going to be joining us in our assembly with a lady from Nugent Care. she is going to tell us all about the work they do and where all of our money will be going and the good work that it will help to do. Reception class are also going to do an Easter Bonnet parade and Year 5 are having a ‘danceathon’! 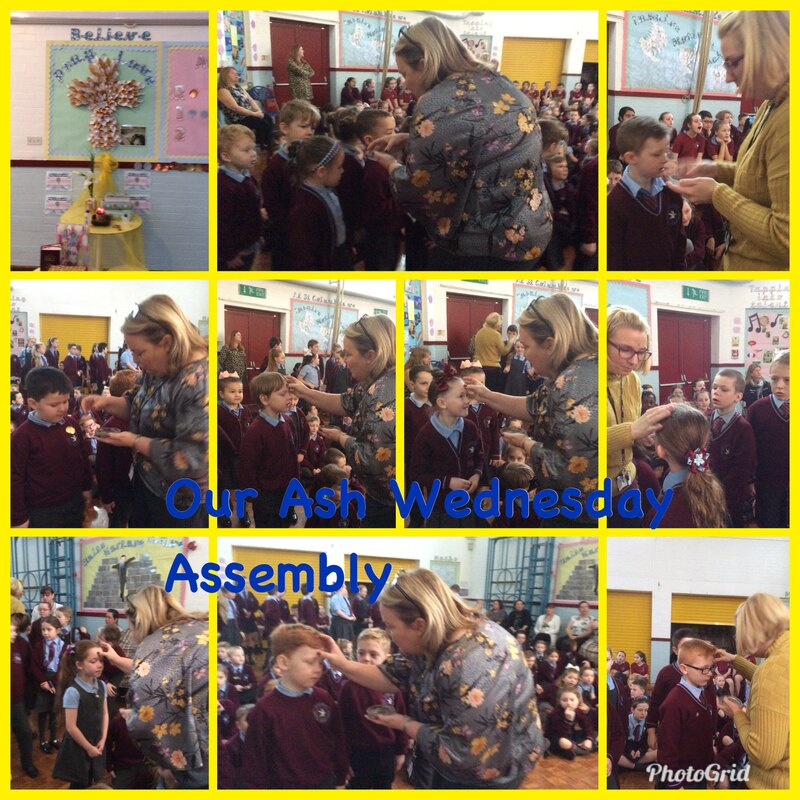 We started our journey through Lent with a whole school Ash Wednesday Service. Where we were reminded of God’s unconditional love for us. As the children received their ashes on their foreheads, they were asked to think about how they could become closer to God, during this season of Lent. They have promised that they will: pray more; go to Church and try their best to ‘ follow God’s path’. We also spoke about how we could raise money for The Good Shepherd; especially if we were going to give something up- what could they do with the money that they would save? We will keep you informed of our fundraising success, which we are usually extremely successful at! What a beautiful few days we have had since starting the new Spring 2 term! The weather has been glorious, and the children have thoroughly enjoyed being in school. This is reflected in the super attendance this week (although this could be because they are desperate to win a golden ticket)!!!! During our celebration assembly, we will have a golden ticket draw. The winning families will be treated to a trip to the Cinema and Pizza Hut. Next week sees the start of Lent. On Wednesday we will be having our Ash Wednesday Service and will be thinking about acts of kindness that we will focus on, particularly during this season of Lent. Next week I will let you know who the lucky winners are and will share with you the acts of kindness that we will promise to work on. It is so hard to believe that we are half way through this academic year. So far, there have been many things to celebrate. The children are working harder than ever and their books demonstrate the pride they have in their work, as well as the progress they made. We are incredibly proud of them. The children performing at the Peace Proms, with thousands of other local children. Our year 6 children taking part in English and Maths Master classes with a cluster of local schools. Being chosen to take part in The Merseyside Mini Police Initiative. I cannot wait to see what the second part of the year holds for us. I hope that you all have a wonderful break and come back to school ready to embrace the season of Lent, and work as hard as ever. Year 6 are so excited to be taking part in a study about peer massage. They will be helping John Moore University demonstrate the positive impact peer massage has on stress. 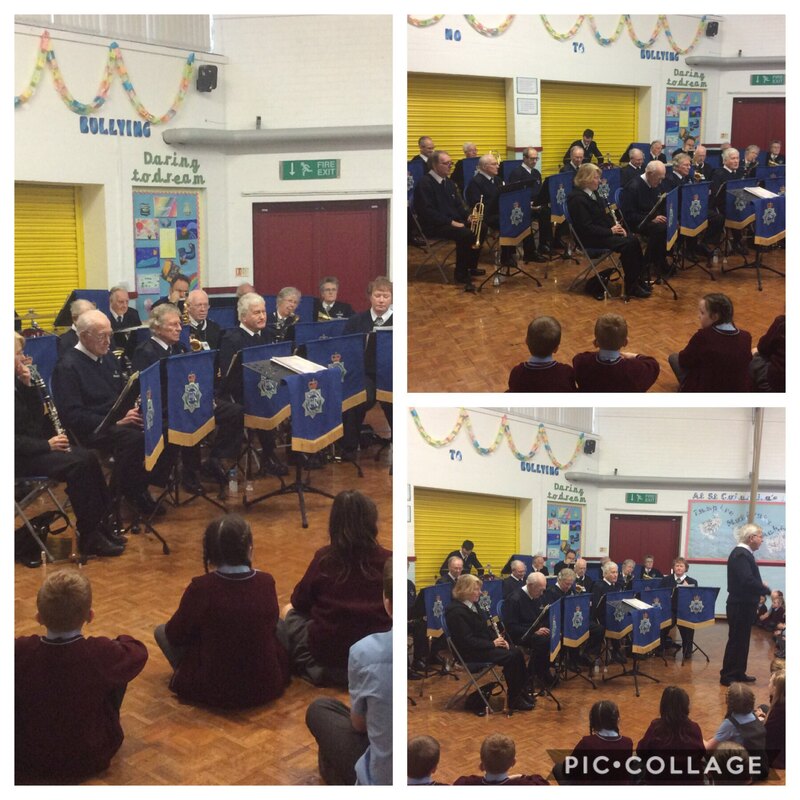 Thank you so much to the Merseyside Police Band for coming to see us today. We thoroughly enjoyed listening to your music. was delighted to receive the email below this morning from the organisers of the Peace Proms; it is our third time taking part and it gets better every time. Huge thanks and congratulations to everyone who participated in Liverpool Peace Proms 2019 at the M & S Bank Arena last Saturday. The choirs were absolutely sensational, both the singing and the choreography were outstanding. It was incredible to see the months of work come to fruition over the weekend, in spectacular style. Please pass on our congratulations to all the children for their sparkling and brilliant performances!! Thank you for being so helpful along the Peace Proms journey from project commencement at registration last year, to concert day; from getting all your information and details to us accurately and within deadlines; through the choral workshops; to managing your choir groups on concert day. This contributed enormously to a fantastic concert. We hope that the children had the ‘best day ever’, and will have wonderful, positive and lasting memories of this special occasion. We hope that they will carry the messages expressed in the songs with them throughout their lives and aspire to do their best throughout their lives. We hope they will ‘shine’, and always make their voices heard in the knowledge that they can ‘inspire’, ‘empower’, ‘enlighten’ and ultimately ‘heal the world’. Finally, we hope that the experience of singing with a full symphony orchestra will strengthen their confidence and inspire them to participate in musical projects throughout their lives. To the Principals and Teachers who participated last year and returned this year – HUGE THANKS FOR YOUR CONTINUED SUPPORT, and to everyone who sang with us for the first time – HUGE THANKS FOR JOINING PEACE PROMS 2019. Our children certainly did shine with confidence, and they certainly were an inspiration to our school.